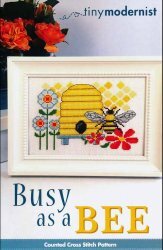 Busy As A Bee [C5833] - $9.00 : Yarn Tree, Your wholesale source for cross stitch supplies. Cross stitch pattern from Tiny Modernist. This pattern features a beehive with a bee and flowers. Stitch count is 61h x 88w.